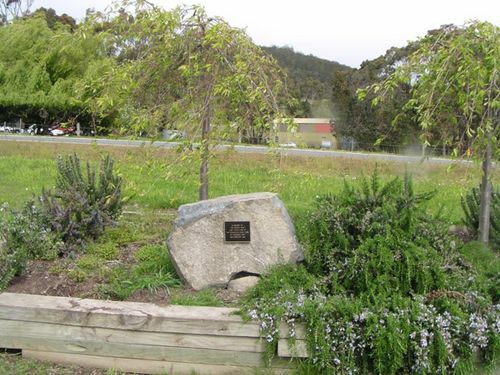 Memorial commemorates those who lost their lives in the bush fires of December 1897 and February 1967. For a week in 1897 , the Hobart area had bushfires which became very dangerous on 31 December (1897). At Kettering, in the vicinity of Oyster Cove, 21 homesteads were destroyed & 2 men died in the fires. Over the four days leading up of the 7th February 1967, a period of extreme temperature and low humiidty was experienced. the fire index of 96 on the day of the fire was one of the highest readings on record. There were winds of up to 65 knots. There were 62 deaths, 900 injuries and over 7000 people made homeless and huge losses of livestock. A total of over 3,000 buildings (including 1,293 homes and 128 major buildings (eg factories, churches, schools & POs) were destroyed, about 80 bridges and thousands of power poles, 1,500 vehicles, 5,400km of farm fences and 265,000 ha burnt (including orchards [20% of State fruit crop] other crops, pasture and forest).